directions: spread 1 tablespoon of pesto in bottom third of tortilla. 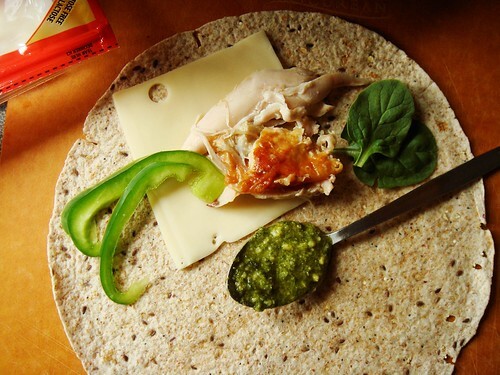 Layer with cheese, big handful of spinach, few strips of green pepper, and handful of chicken pieces. Form into tight wrap and seal with foil. The order of ingredients matter because pesto is oil-based and waterproofs the tortilla. Cheese barricades vegetable from pesto so they remain crisp.